Projecting a bright picture of tiger conservation, the number of big cats in the Terai region has grown significantly with at least 71 new adults roaring, say reports from the latest Phase-IV of monitoring. The highest rise so far has been recorded in Uttarakhand's Western Circle -- a huge part of the vast Terai region of the state located outside the tiger and forest reserves -- where the figures went up from 79 in 2014 (last census) to at least 119 adults till last year, officials said. Meanwhile, at Kishanpur Wildlife Sanctuary and Dudhwa National Park of Dudhwa Tiger Reserve, situated in the Terai region of Uttar Pradesh bordering Nepal, the number of tigers has increased from 53 in 2014 to at least 79 adults. The numbers in Assam's Manas National Park, also part of the Terai landscape, have also risen though the final results are awaited, officials said. The Phase-IV monitoring was conducted in a few forest divisions including the West Circle of Uttarakhand and parts of the Dudhwa Tiger reserve in 2016. The monitoring is under way in some reserve forests including Corbett and Manas, and yet to be conducted in several other parts of the country. "The number of tigers has increased significantly. Over 50 adults have been identified for the first time," Dr Parag Madhukar Dhakate, Conservator of Forests, Western Circle, told IANS. A good number of cubs were also counted but officials requested that the numbers be not disclosed. "All tigers and cubs were healthy. It projects a good prey-predator ratio," Dhakate said. The western circle spreads over 2,573.6 sq km (from Haldwani to Ramnagar) comprising 60 per cent natural forests and 40 per cent plantations. The figure projects distribution of a breeding population of tigers living outside reserve forests in a complex landscape which also include agricultural fields and human encroachments. The Phase IV monitoring of the western circle is an independent census (self-initiated) and one of the firsts in the country conducted over a large area. It started in Janaury 2016, officials said. "The monitoring was carried out for 214 days using 250 camera traps used at 393 locations. A total of 16,457 images were obtained," Dhakate told IANS, adding that the mission included 500 people. Images obtained from camera traps were fed into a software; manual identification was also done to estimate the numbers. Like the finger prints of humans, every tiger has unique stripes, which is now the modern method for counting and distinguishing tigers. "We now have a baseline... earlier we were not sure of the actual number of animals but now we know areas where tigers are present. This will help us modify the protection strategies," Dhakate said. Experts believe that the reason for such a boom is the "heterogeneous and complex landscape" of the western circle that supports the species better because of automatic "niche construction". Niche construction or ecosystem engineering is a process in which organisms modify their environment for survival. "In such complex landscapes, unlike homogeneous landscape of a typical forest, prey density for animals is good because a niche for different animals is automatically created," said Dhakate. Meanwhile at Dudhwa Tiger Reserve, a healthy tiger population, along with some cubs, was seen during Phase IV monitoring from October to December 2016. 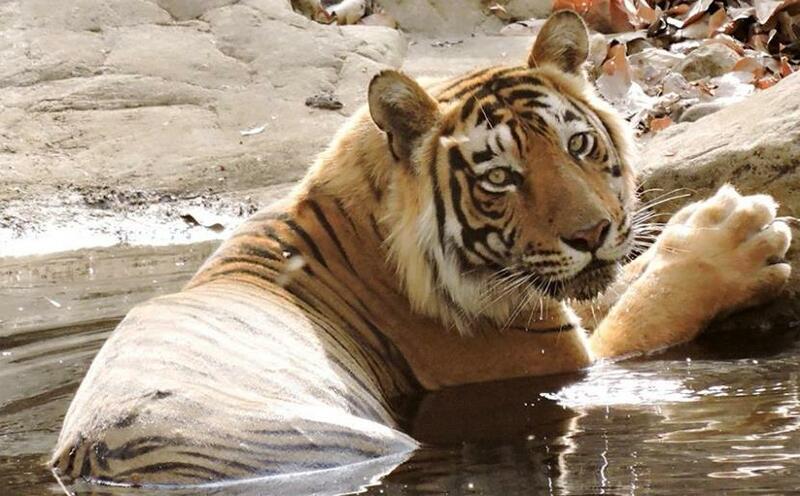 "With 51 tigers in a small area of 227 square km, Kishanpur Sanctuary has one of the most dense populations of felines," Sunil Choudhary, Field Director, Dudhwa Tiger Reserve, told IANS. Narendra Upadhay, Wildlife Warden at Dudhwa, however, believes that the number of tigers in the national park is under-reported as its dense landscape minimises visibility. Manas National Park in Assam has also seen a slight increase so far, as the number of tigers in two of the three regions of the reserve forests has gone up from 11 in 2014 census to at least 16 in November 2016. "This time we are also doing census in the western division of Panvari, which was left out in 2014. We expect a good result in the final count," H.K Sharma, Field Director, Manas, told IANS. India is home to 70 per cent of the world's free-ranging tigers, estimated at 2,226 in 2014, of which at least 640 dwell outside tiger reserves. The boom in population is believed to be a good sign for 2017, as 129 tigers died in 2016 due to poaching or accidents, the highest in a decade. The Terai arc landscape includes the fertile lowlands of the southern Himalayan and Shivalik foothills and north of Indo-Gangetic plains in Nepal, India, Bangladesh and Bhutan. It spreads over 49,500 sq.km and is home to 86 species of mammals, over 600 species of birds, 47 species of reptiles and amphibians, 126 species of fish and over eight million human beings.